One of the things I heard regularly from my parents when I was a kid was, “say thank you.” I know, terrible parenting, right? The nerve of them trying to teach me to say thank you every time someone did something nice for me, brought me a gift, or helped me. Yep, it’s getting to that time of year when marketers and business owners start to think about how to thank their clients. We look back on our business over the past year, note the good customers (and the really good customers), and wonder how can we thank them? Sometimes it’s a lot of pressure. What should I do for my best customers? Do I need to send them something? Should I send the same thing I did last year? Some may think it’s just a waste of time and money, what’s the point? From a marketing perspective that end of year client thank you is a great idea. You remind people about your business, especially those who haven’t bought from you in a while. Some businesses have remaining budget to spend, why not spend it at your business? And people just like to be appreciated, it makes them feel good and people who feel good tend to spend more. So back to the “what”. What do you do to thank those good and really good clients? I have a few simple ideas. Send a card. Tried, but true, sending a card works. But don’t just do to the store and buy a box of Happy Holidays cards. Take the opportunity to get creative. Have cards printed with your logo or branding, tell a fun story about the past year at your company, or write a personal note. Then sign them, don’t just stamp it, show your customer that you value them enough to sign the card. Send a gift. Sometimes sending a gift is a great idea. Try to think of something that highlights your business, have it printed with your logo, send it nicely wrapped. This is especially nice for your really good customers. Call them. No matter where in the world your customer are, pick up the phone and give them a call. Tell them you really appreciate their business, thank them for helping you and your business, wish them a fabulous new year. Something as simple as that can have a big impact. Remember even though we all hope this end of year thank you will bring you more new business in the coming year, this one’s about the Thank You. Don’t clutter up your message with new product announcements, requests for referral business, or sales reminders. Make this one count. Here’s a bonus tip: Don’t just do it now, do it all year. Don’t wait until the end of the year to say thank you. You should say thank you every time a customer makes a purchase. Thank them on their invoice, packing slip, receipt. 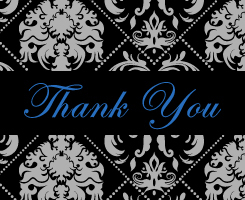 And thank you for reading my Marketing Blog this week.